Few modern Chinese artists have achieved such renown as Xu Beihong. Famed not only for his prodigious output but also for his gregarious styles, he worked in the European manner in oils, infusing his Chinese brushwork with moments of the Western aesthetic of definition through light and shade. 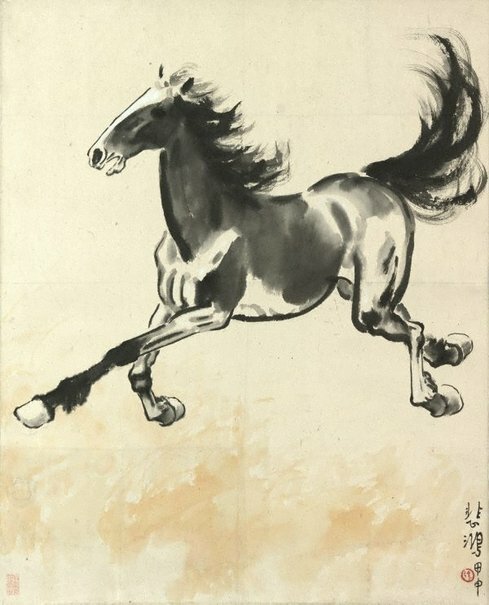 He became immensely popular and widely known with his series of ink paintings of ebullient horses, of which this is a prime example. The painting is dated to the 'jiashen' year (1944). After an unusually international life, Xu Beihong finally settled in Beijing in 1946 as principal of the Beijing College of the Arts and then from 1949 as head of the Central Academy. A memorial museum, devoted to Xu's life and work is located in Beijing. The Asian Collections, AGNSW, 2003, pg.171. Singed and dated, l.r. in Chinese, inscribed in black ink, 'Beihong, the year of Jiashen (1944)'. Singed l.r. in Chinese, stamped in red ink "Xu” [artist's seal], round relief. Asian Collection Handbook, Art Gallery of New South Wales , 'Chinese Painting', pg. 42-52, Sydney, 1990, 51 (colour illus.). The Asian Collections Art Gallery of New South Wales , 'The Shanghai School and Modern Painting', Sydney, 2003, 171 (colour illus. ).